We had the best engagement session with Austin, Stephen, and the cutest, most photogenic pups! Aren’t they adorable!? You’ll see what we mean below! 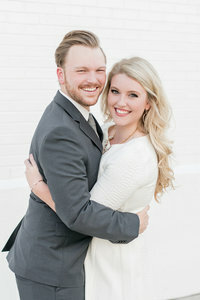 These two are such a cool, low-key couple, and we loved photographing them around their Highland Park home. They were troopers in the cold weather, and when Stephen offered Austin his coat to warm her up, it made for a perfect photo opp! The fall colors, coupled with how gorgeous these two are together, created an awesome engagement session! Austin and Stephen are tying the knot at Redeemer Community Church in Avondale and then celebrating with their family and friends at historic Rucker Place in the Five Points neighborhood of downtown Birmingham! It’s going to be the best day, and we can’t wait!